In 2010, a man by the name of Kieran Doherty was found shot dead in Londonderry, Northern Ireland, naked and bound and dumped by a roadside. It was a heinous crime. After following the process that exists in such circumstances, Doherty’s mother and grandmother have now been awarded an undisclosed sum by the Criminal Injuries Compensation Appeals Panel, described by Doherty’s uncle as a ‘substantial’ amount. It all sounds quite reasonable, until you realise that Doherty was a member of the terrorist Real IRA and the killing was carried out by his own terrorists-in-arms. He was also a convict who had served time in prison. So what we have is a man who opposes Northern Ireland being part of the UK, who resents the British and views them as an occupying force and therefore joins a terrorist organisation to take up arms in support of Irish unification, because at this time the majority of people in the country want to remain part of the United Kingdom. He falls foul of his fellow men of violence and is ‘executed’. Not only has the British taxpayer funded the murder investigation by the PSNI and an additional investigation and report into unfounded allegations of MI5 collusion in the killing, but we are now also having our pockets picked pay the family of this worthless terrorist scumbag compensation for his murder – which was brought about because of his fetish for the bomb and bullet and his desire for violence over democracy. Our money should not be squandered in this way. Doherty bit off more than he could chew and deserved to pay the price. We should be pleased there is one less gun toting bomber to contend with in Northern Ireland, not handing out compensation for his killing. His family almost certainly knew of his involvement in the Real IRA, yet they will now benefit financially from the consequences of that membership at our expense? Their compensation claim was an insult and should have been thrown straight into the nearest bin. Clearly it is we taxpayers who really end up paying the price, of the stupidity of officials who fall over themselves to make nice with terrorists and their families by wasting our money to reward their criminality and hatred of this country, and treating us as a bottomless pit to do it. The State propaganda organ has continued to indulge itself in ludicrous spin over the last two days in Northern Ireland. For it is from there the BBC has been reporting in detail about the opening of the so called ‘Peace Bridge’ in Londonderry. 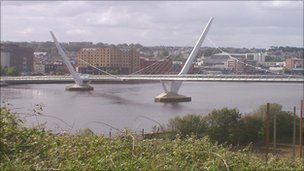 At a cost of £14.6m, the new ‘peace bridge’ in Londonderry/Derry is the latest attempt to bring Protestants and Catholics closer together. At the moment, most Protestants live on the east bank of the River Foyle, most Catholics live on the west bank. Some are reluctant to cross to the other side. The idea is to try to bridge the gap. In Londonderry/Derry – sometimes referred to as stroke city – the level of sectarianism is not as bad as it used to be. The hope is that the new bridge will help to improve relations even further among its 100,000 residents. Improve relations among Londonderry’s 100,000 residents? What Simpson has deliberately omitted from his meandering waffle is that thanks to murders, beatings and sectarian intimidation at the hands of republicans/nationalists, thousands of unionist protestants have fled their homes in the city. In fact in Londonderry there are now less than 500 protestants left. To put this into context the city used to be home to more than 15,000 protestants when the Troubles started. But now there is hardly any protestant community left with which to improve relations. The message as always is ‘all is well, there’s nothing to see here’. The reality as always is something rather different. Funding came from the EU’s Peace III programme under the Shared Space initiative which supports projects that bring together communities that have been formerly divided. Given the EU’s track record of waste it is no surprise it thought spending £15m of our money on such propaganda was a good thing to do. If the EU wants to bring together communities that were formerly divided it will need to build a bridge that starts at the Foyle and goes a considerable number of miles to where the protestants who have fled Londonderry now reside. This is not a peace bridge, it is a monument to the successful ethnic cleansing of the vast majority of the unionist population from Londonderry’s Cityside. One wonders how the BBC would be covering this story if it was Catholics and republicans who had been expelled from the city rather than the protestants BBC editors think of as an eccentric oddity who are of little consequence. 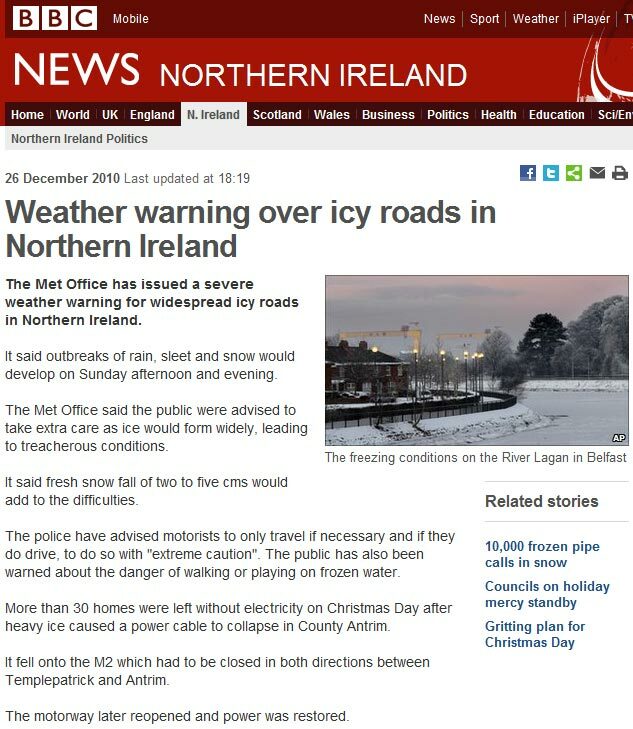 Following on from Richard North’s piece on EU Referendum ‘The Story Continues’ about BBC reports of snow falling at the summit of Mount Snowdon in Wales on Friday (despite a story three years ago suggesting all snow would disappear from the mountain within 15 years), we are pleased to bring you the Northern Ireland edition. Savour if you will these images published on the BBC NI website from the village of Comber (pronounced Cumber) in Northern Ireland, which sits a few minutes south east of Belfast. They were taken on the evening of Thursday 9th June 2011. 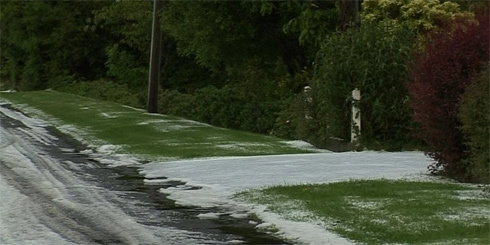 BBC weather forecaster Angie Philips said hail was not very unusual in June. 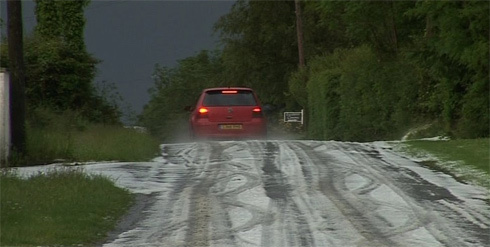 Given the scale of the hail storm they experienced, the good folk of Comber may beg to differ. And let me be clear, as someone born and raised in Northern Ireland who now lives in London and will never return to the province, I feel sickened by the way ‘my country’ comes cap-in-hand; particularly at a time when the people in England have their own financial challenges to contend with. After all, what opportunity is there in a nation which wants nothing more than to live off the hard work of others. It’s pathetic, and so long as there are people like Bumper [Bumper Graham, the assistant general secretary of the Northern Ireland Public Service Alliance] around that’s how it will stay. 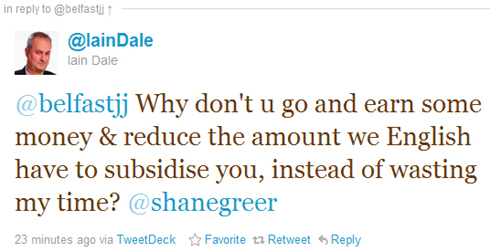 It seems Greer thinks the trade unions are Northern Ireland and therefore the entire province is a beggar. But of course that doesn’t generate a headline, so he has purposely chosen (wrongly) to tar the entire place with the same brush. It is as lazy as it is dishonest. He would have been well advised to suggest the State should stop its incessant meddling in NI which is the reason so much taxpayer money gets spent there, buying off terrorists and bile filled interest groups of various stripes. Perhaps there is an awareness among Northern Irish people that this is the way they are viewed by the Tory talking heads, which possibly accounts for the dismal electoral showing for anyone professing to be a Cameron Conservative. After all, why would people in the province vote for a party whose visible supporters in the media demonstrate such undisguised contempt for them? Now I am a supporter of the Union and also believe England should have its own Parliament within it. But Dale’s wrongheaded and arrogant comments demonstrate an ignorance of the contribution Northern Ireland makes to the Union and a desire to couch everything in narrow financial terms. One wonders what CCHQ thinks of its vocal cheerleaders spouting such views. The full extent of Republican terrorist violence in Northern Ireland has been spelt out in the Independent of Sunday (IoS) today. 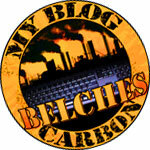 But before we go into the details, it is important to apply some necessary context and explain where blame resides. Anyone who has read Heather Brooke’s excellent book ‘The Silent State’ will remember her examples of how authority tries to hide the reality of crime and makes it all but impossible to get meaningful information about what crime is being perpetrated and where. The approach makes it easier for the authorities to proclaim their approach to reducing crime is working – even though crime figures are nothing more than the extrapolated findings of the regular British Crime Survey of around 40,000 people . Crime hotspots are missed, certain offences are excluded (such as murder) and until recently crimes against minors were not counted. The reality on the ground for people living in our neighbourhoods does not tally with the impression of sunlit uplands presented by the government. This has long been the case in Northern Ireland. The difference with Northern Ireland is that there has been a collusion between the authorities and the media to play down the simmering violence that has continued in the years since the Good Friday Agreement. The authorities wanted to portray Northern Ireland as having thrown off terrorism and having moved into a era of peace and prosperity. The reality on the ground was very different, but outside of Northern Ireland people looking on the BBC NI web pages would have long thought the official line was the truth. Incidents that were taking place around the province were being reported in the local media – after all the reality could not be hidden from locals – but there was a blackout elsewhere in the UK. Now that has all changed. The extent of the violence and significance of the terrorist incidents could not be hidden any longer once the Police Service of Northern Ireland starting asking for more money and resources to combat the ‘dissident’ threat after pressure from the Northern Ireland public. With the cat out of the bag the BBC finally started filing news stories that reflected the reality of the low intensity conflict. But the damage had already been done. Many people in the UK are left with the impression that the Republican terrorists have spontaneously re-emerged to shatter the peace, when all along peace was an illusion. The only thing that has changed is the Republican terrorists have enhanced their capability and, rather than just injuring PSNI and military personnel, have been successful in killing soldiers and police officers. There has been an increase in incidents, but there was always a substantial number of incidents taking place. 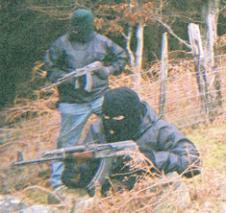 The breakneck effort to drawdown security forces in Northern Ireland and decommission assets necessary to combat terrorist activity has given the republican groups the space to recruit, train and carry out attacks. The pandering to IRA/Sinn Fein by the Labour government, which is carrying on under the faux Conservatives, has increased the threat in Northern Ireland and restored a threat to mainland Britain. Does anyone think this security force drawdown would have been allowed to happen if the UK public were more aware of what was really going on in Northern Ireland? Does anyone think the increased tempo of Real IRA and Continuity IRA attacks would have happened if the drawdown had not taken place? The BBC should shoulder a substantial proportion of the blame because anyone in the UK reading its Northern Ireland news page would be shocked to learn what the IoS has reported today. For we learn that between 2008-2010 there were no less than 272 paramilitary attacks – around two per week – and of those only 12 cases have been solved by the PSNI. In 2010-11 alone there were 100 incidents involving bombs. Sadly, although he has spoken about this before in 2009 and 2010, Mr Spence was at least two years late in going public with comments on this subject. Denial by the government, PSNI and media has allowed terrorism in Northern Ireland to flourish, and we have the latest lethal example of how the establishment has failed the people it is supposed to serve. Instead too much focus was devoted to self serving agendas. How can people have any trust in the politicians, police and media when their spin has been so comprehensively shattered? Is the Met Office becoming irrelevant? A strange question perhaps, considering the considerable political influence the Met Office has within political circles when it comes to energy and climate policy. But certainly one worth asking following a comment by Northern Ireland’s Regional Development Minister last month. Forecasts of another seven years of the extreme winter that triggered the burst pipes crisis in Northern Ireland may force changes to how water is plumbed into homes, the regional development minister has warned. Conor Murphy, facing questions from his Stormont scrutiny committee on the Christmas emergency, said some meteorologists believed the region had entered a weather cycle that would see successive deep freezes. In the face of that, Mr Murphy said the Executive may have to look at changing building regulations to ensure that water pipes are buried deeper and insulated better. What makes the comment interesting is this response to a Freedom of Information request submitted by Autonomous Mind (using an alias), enquiring which Meterologists provided this advice and requesting a copy of the advice that was provided to the Minister enabling him to make his assertion. 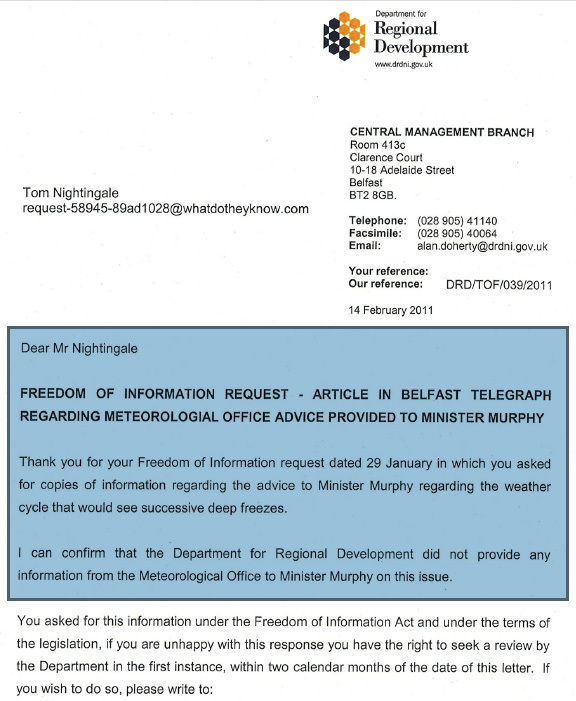 This shows that for all his multitude of failings, Conor Murphy is listening to what meteorologists other than the Met Office are saying about changes to our weather that contradict the Met Office line of ever increasing warming. Not only that, they are using what they have listened to in official evidence to government committees. A very small example maybe, but marginalising the Met Office in this way – intentionally or otherwise – represents a visible crack in the climate consensus that has consistently told us mankind is changing the climate, making the world warmer and the result will be warmer and wetter winters. The structures are weakening. On this blog and elsewhere I have spent several years arguing that the threat from republican terrorists in Northern Ireland was being systematically downplayed to give a false impression that all in the province was well. Despite repeated assurances from the Stormont administration that the ‘dissidents’ are only few in number; and a shocking refusal on the part of some media outlets to report some terror incidents over the last couple of years, both now seem to have come to an reluctant acceptance of the true state of affairs. And that reality is borne out by the request from the Police Service of Northern Ireland (PSNI) for an extra £245m over the next four years to combat ‘dissident’ republican violence. 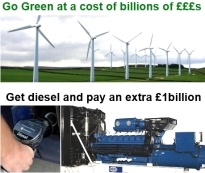 An extra £61m per year is a huge some of money for a minor problem. Clearly the number of terrorists involved with these groups, their increasing capability and enhanced reach can no longer be swept under the carpet and dismissed as a little local difficulty. Giving us yet another reason not to trust anything the political class say, it is clear weapons we were assured by terrorists and politicians had been put beyond use, under independent scrutiny, are being used having been transferred to these groups by the IRA. Maybe now the political class will be hauled back into the real world to deliver on the obligations they have failed to fulfil as they engaged in spin and self congratulation. Hopefully not too many more lives will be lost while the security forces try to get hold of what they were instructed to let go of. 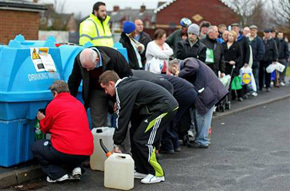 The fallout from the unfit-for-purpose utility that is Northern Ireland Water shows no sign of ending any time soon. It has just come to light that almost £25 million allocated to upgrade Northern Ireland’s ageing water system was given back to the devolved government in December. “One has to ask why NIW were unable to spend the £25 million when the need for improving the water infrastructure in Northern Ireland is well-known. This indicates poor financial management within NIW, and a lack of clear leadership within that organisation far beyond the former chief executive (Laurence MacKenzie). Perhaps Conor Murphy is finding it harder than he expected to make the adjustment from being a member of the IRA and possessing explosives to being a member of a government and possessing control of a government department. Perhaps he is in denial of the reality at NI Water, but then, denial seems to be something that comes naturally to him. But you can fault everything else! When it comes to stupidity it seems the good folk at Northern Ireland Water are in a league of their own. From hiring a Chief Executive with a criminal record for theft to paying him nearly £100,000 when he decided to resign, it seems NI Water’s incompetence is constantly plumbing new depths. 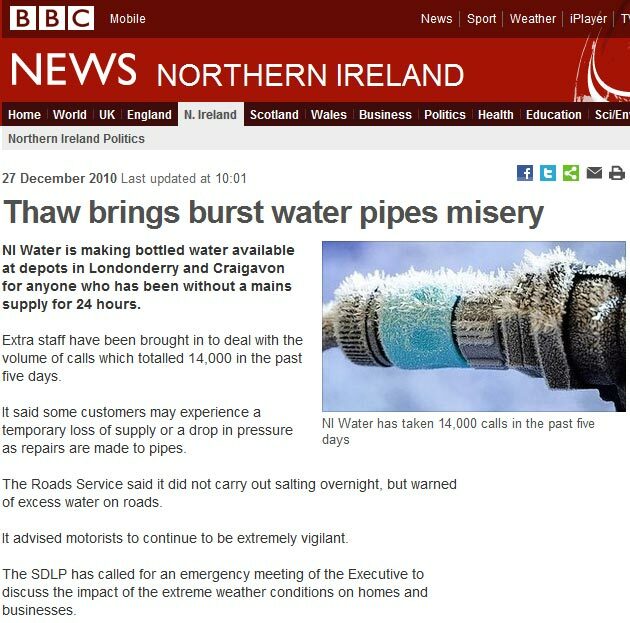 As water regulators scrutinise the publicly run utility following its operational implosion as tens of thousands of water pipes burst during the December freeze, a Northern Irish politician has submitted a reasonable question in a Freedom of Information request. “I am astounded by their refusal to answer and the utterly fatuous excuse concocted to try and keep this pertinent information from the public. “In the most contrived and indefensible response to a FOI request that I have ever seen, NIW says releasing such information ‘could potentially prejudice the progress and outcome of the Utility Regulator’s ongoing investigation’. “It gets better, because then they say, ‘Premature disclosure of information pertaining to the investigation, whilst the investigation is ongoing, could potentially result in closing off options through adverse public reaction’. It’s yet another example of how today’s public servants tend their master. Things are run for their convenience and benefit, not those who pay their wages and suffer from substandard performance. 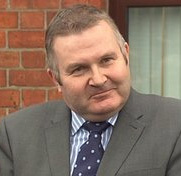 Allister suspects, as many others do, that White is another one of those networking Chairmen who get paid a handsome sum for a few hours work a week for no discernable benefit to the organisation – and that NI Water fears a backlash for paying out big money to a man whose Board failed to ensure the utility was fit for purpose. You’re resigning? Not unless we can pay you £97,000! What kind of utter moron agrees to employ an executive on terms that give six months’ pay in lieu of notice as a ‘minimum contractual entitlement’ when that executive voluntarily resigns from their position? What kind of moron then agrees to pay that executive thousands of pounds to cover the cost of their ‘legal and tax advisors’ when they have voluntarily resigned? It’s all so easy when you’re using tens of thousands of pounds of other people’s hard earned money. This is the perverse reality for the poorly served the people of Northern Ireland, who have stood by powerless as the resignation of Northern Ireland Water Chief Executive and convicted thief Laurence MacKenzie, has turned into a lottery jackpot for him. Thousands of MacKenzie’s customers have had to endure an absence of running water since before Christmas, and thousands more have suffered serious interruptions to their supply on a rota basis. Yet the first person to get any money after this fiasco is the man whose responsibility was to ensure adequate investment in the water infrastructure and who failed miserably. And it’s all thanks to NI Regional Development Minister, Conor Murphy who signed off the payments. And worse of all, it is not even an undeserved compensation payment for being shown the door because he and the Northern Ireland Executive state it was his decision to leave. In the real world where people resign they work their notice period and leave with nothing. But in the bubble of the old boys network that makes up the executive and political community in the UK, they agree lavish contract terms that defy reason or logic and ensure a big fat payoff regardless of performance or the manner of their departure. It is a naked abuse of their position and a misappropriation of public money, but the people are powerless to hold these thieves to account. MacKenzie should be paying the price for his failure. Instead he is cashing in at the expense of his long suffering customers. And it’s all sewn up, nice and legal like, thanks to the parasites who help each other slither into positions of power in our public bodies and the law. There has to be a reckoning. How does a convicted embezzler become head of a water company? One would think that a vital quality for any person running a company – particularly one in the public sector – is honesty. Which is why it defies belief that the former head of Northern Ireland Water, Laurence MacKenzie, was ever appointed to his job at NIW and his previous role as head of Northern Ireland Electricity, having stolen £2,000 while working as a teller at the Bank of Scotland nearly 30 years ago. It seems that once you have become part of the executive in-crowd the normal standards of competence and probity are dispensed with. The rules of the game are different for members of the club once your friends in high places start to clear grease from the pole to let you climb ever higher. Small wonder that so many public bodies exhibit falling standards and are tainted by executive incompetence. Update: Subrosa has more local background from Scotland where the theft took place. 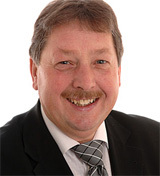 Writing today in Belfast’s NewsLetter the former Northern Irish Environment Minister, Sammy Wilson, has hit out at the slow response to the interruption to the water supply in the Belfast area, and the appalling lack of communication that left affected residents and businesses guessing about when their supply would be restored. […] However, the discomfort of the harbingers of climate doom is overshadowed by the impact which the harsh winter has had on many across Northern Ireland where it seems we are unable to cope with the extreme conditions which this winter has brought. To some extent the blame lies with the global warmists in the Met office and the policy makers who find it hard to admit that they are wrong and we should prepare ourselves for climatic conditions which their computer models claim cannot possibly occur. For his clear thinking and principled approach Wilson was drummed out his ministerial role and marginalised at Stormont and in Westminster. He was mocked by the ‘consensus’ of politicians who are bought in to the alarmist narrative. However it has not taken long for Wilson’s appraisal of the alarmist claims to be vindicated. Those with a global warming agenda have convinced those whose role it is to provide contingency measures that weather and temperature is only going in one direction and that snow and ice was no longer going to be a major problem to deal with. After three winters of snow and ice, those warmists are only now, for the first time, claiming such winter weather is evidence of their global warming prediction. Funny how it was never the case before and they had long said snow was fast becoming a thing of the past. Wilson is very much in step with the thoughts of many people who can now see the global warming alarmist claims don’t add up. It is Wilson’s critics and colleagues in the assembly and parliament clinging to the party line who are out of step and out of touch with reality as they put their faith in computer models and demonstrably fanciful predictions. Politics needs more Sammy Wilsons and fewer clones who parrot the mantra of the small clique of party leaders who see advantage for themselves in using the alarmist agenda to push unnecessary and harmful legislation. With the Met Office’s forecasting ability already turning it a laughing stock, their ‘nowcasting’ prowess seems to be in freefall too. Currently in Belfast, where substantial snow and ice has caused all manner of problems, the weather is a matter of major interest. However, no severe weather was forthcoming. In fact the temperature has stayed stubbornly above 5C and the persistent rain has washed away all but a few clumps of compacted ice. The winter wonderland has given way to green fields under the miserable grey sky. In fact, rain was the only thing Accuweather were predicting while the Met Office was making people worried about severe weather that never materialised. A civil action against Northern Ireland Deputy First Minister, Martin McGuinness, on account of his historical leadership in the IRA is to be progressed in the High Court, according to reports in the News Letter. The same paper reported in March claims by Willie Frazer that he had served a writ on Mr McGuinness in the Stormont Parliament Buildings for damages relating to the murder of his father by the IRA in 1975. Mr Frazer said Sinn Fein’s reaction to the findings of the Saville Report had prompted him to progress the case, which will be progressed on Monday. As words go, callous doesn’t seem remotely strong enough an adjective. The contempt shown for this tragic man, who had his father snatched away from him by vicious IRA murderers, is sickening. In seeking to turn this into a matter of electoral politics, rather than a matter of accountability, McGuinness’ Sinn Fien/IRA mouthpieces demonstrate the simmering hatred they retain for those who oppose them. Given that IRA cowards refused to give evidence to the Saville Inquiry perhaps this is the only way of getting Martin McGuinness into a court room to account for his terrorism. Romanticised by many in the media, it sometimes takes actions like this to strip away the faux veneer of respectability around McGuinness and reveal the brutality within. One did not have to be a genius to realise that the release of the Saville Report into the events of ‘Bloody Sunday’ – 12 years in the making at a cost of over £190 million – would trigger a wave of republican and pro-IRA revisionism. Indeed today, 30th January 1972 has become year zero in the republican version of the history of what was vicious civil conflict in Northern Ireland. Listening to Northern Irish republicans and their fellow travellers in the media today as they take advantage of the findings for their own ends, the less well informed in our society could be forgiven for thinking that Bloody Sunday was the start of the ‘Troubles’. People could be excused for believing that the IRA spontaneously emerged in response to a deadly and unprovoked assault on civil rights marchers In Londonderry by members of the Parachute Regiment, that left 13 dead and over 20 wounded. People could be forgiven for thinking that if only the Parachute Regiment soldiers had not opened fire in the tense and intimidating atmosphere of the growing Bogside riot, the violence of the subsequent 26 years would not have happened. It’s enough to make one sick. Of course this distortion of history and lack of context of the nature of things in Northern Ireland in 1972 suits the republicans. It enables them to feed off the ignorance of others, fuel their own sense of injustice despite their own actions, play down the atrocities committed by the IRA and its splinter groups and seek to create what Lisburn Councillor, Ronnie Crawford, recently described as a hierarchy of victims. It is gut wrenching stuff that seeks to capitalise on the deaths of innocent people. The fact is, despite the wrongs committed by the Paras, there was a riot in progress and armed IRA terrorists were present, stirring violence out of what was supposed to be a peaceful civil rights march. Let’s put Bloody Sunday into greater context. Three days before that fateful Sunday two young RUC policemen, Peter Gilgunn and David Montgomery, had been ambushed and shot dead in their patrol car on the Creggan Road by the Londonderry IRA – an attack almost certainly sanctioned by Martin McGuinness. A day later in Belfast a young off duty RUC officer, Raymond Carroll, was shot dead at a petrol station by the IRA. On Bloody Sunday itself, a British soldier who had been shot in Londonderry’s Bogside four months earlier by an IRA sniper during a riot, Maj. Robin Alers-Hankey, died of his injuries. 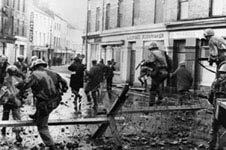 It was in this environment that the Paras arrived on the Bogside to man barricades during a lawful civil rights march, but then came under attack by rioters. Saville tells us that the Paras opened fire on the crowd, an action that was unjustified and unjustifiable. If Saville’s findings reflect reality, and there is no reason to suppose otherwise, there is no defence for the actions of some of the Paras on that day and I say that as someone who has served in uniform. There is no excuse for any deliberate killing of an unarmed civilian, but it is not hard to understand how the killings took place in light of the murderous actions that took place in the days leading up to Bloody Sunday and the violence on the day itself. Bloody Sunday was not the start of the Troubles. It is a mere bookmark in their history. From the start of the Troubles in 1969, no less than 226 civilians, terrorists, policemen and soldiers had died in shootings, bombings and by their own evil hand in the commission of terrorism before Bloody Sunday. 30th January 1972 is not year zero. IRA terrorists and enablers such as Bernadette Devlin McAliskey should not be allowed to get away with such a cynical misrepresentation in their efforts to rewrite history to castigate the security forces, while airbrushing their own sickening catalogue of terror from the annals. It is beneath contempt for someone like her to call for Britain to be put in the dock for a handful of soldiers losing control on one terrifying afternoon, while acting as if her friends who waged a brutal reign of terrorism, racketeering and criminality resulting in the deaths of thousands over the course of three more decades, are saintly innocents. As many commentators have reminded us, thousands died in Northern Ireland and across the UK and Europe as a result of republican and loyalist terrorism and the fight against it. The families of other innocent victims will not enjoy 12 year inquiries funded by millions of pounds of taxpayers’ money to give them closure or exhonerate their dead. The apologists for terror should not be allowed to hijack Saville for their own ends and construct a revisionist version of history, but sadly this inquiry has handed them the opportunity on a plate and it seems no one has the courage or the will to stop them. It is not just opportunistic, it is the ultimate insult. Simon Winchester, who reported on Bloody Sunday for the Guardian in 1972 and has returned to write about the report today, has just been speaking to me on the phone from outside the Guildhall in Derry. The question is something of an insult to unionists. Anyone journalist worth his salt would know and faithfully report that these days there are not many protestants to be found in Londonderry – population over 85,000. An estimated 97% of Protestants have fled Londonderry during and since the Troubles, leaving only around 500 in the city, mainly in the Fountain area. Given that thousands of unionists have fled their homes in the city after suffering murders, beatings and sectarian intimidation at the hands of republican thugs, to ask if they are visible during a mass republican march to the Guildhall is either extreme idiocy or plain spiteful. Three days ago this blog said Peter Robinson’s political career was finished because the press had enough dirt to pull the rug from under him. In the post was cited just one example of this concerning allegations that he has previously hit his wife. But it seems there must be more dirt concerning financial irregularities and misconduct that the press has uncovered, because just minutes ago Robinson stepped down as First Minister of Northern Ireland. It is unlikely to be a coincidence that this move has happened just hours before BBC Panorama airs a special programme on the Robinsons. 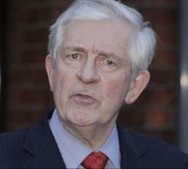 The resignation is is supposed to be a temporary measure for up to six weeks and Robinson has placed Arlene Foster in the position of interim First Minister. Autonomous Mind is wagering that despite the DUP offering Robinson their full support, behind the scenes the jockeying for position is already underway as supporters of Foster, deputy leader Nigel Dodds and Jeffrey Donaldon ready their leadership bids. The likelihood of Robinson returning will reduce with each passing day. The downfall of Northern Ireland’s mini political dynasty looks to be upon us. Iris Robinson, wife of First Minister Peter Robinson, stands accused of failing to declare her financial interest in a business venture, for which she arranged the financing, while sitting on the local council that in turn then awarded a contract to her teenage lover, Kirk McCambley, in 2008. The real-life Mrs Robinson, having been caught in her attempt to make money on the side from the deal she helped broker for her young love interest and failing to declare her substantial interest in the matter, dived for cover behind the excuse of suffering from “mental illness” through depression when it became clear the story was going to break. 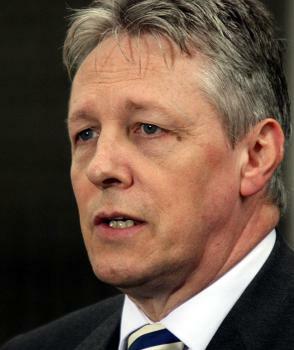 With Mrs Robinson’s career almost certainly set to be destroyed by the allegations, commentators are now speculating whether Peter Robinson will be forced to resign too. It is alleged that when he learned about his wife’s affair and financial dealings with Benjamin Braddock Kirk McCambley, Mr Robinson ordered the money to be repaid, but crucially failed to report it to the authorities. If proven to be true, that would make his position untenable and throw the Democratic Unionist Party into disarray. For now Mr Robinson is trying to tough it out and says he’s staying put. But how long will he continue to dig his heels in if the media decides it wants to take his scalp? For many years residents living near the Robinsons in the close knit community of East Belfast have gossiped allegations that he has on occasions assaulted his wife during their marriage. There is no doubt the press know about the rumours but in discreet French fashion they have refused to report about them. The question now is will the press change its mind in order to bring about Mr Robinson’s political demise?